Off topic but still acceptable for this blog is the subject of today's entry, the movie Opera Jawa. At the end of the movie, choreographer Eko Supriyanto was asked how the Indonesian people felt about the film. He mentioned that it had a small domesitc release, only being shown in Yogya and Sala. Very popular in Indonesia, specially in the island of Java is the Kaki Lima. Men, who push a cart to sell their treats. The men also make a distinct sound according to what they are selling. There is also a schedule to the menu too. These carts are fully functioning kitchens. They have propane powered stoves to keep the soup/noodles piping hot. The only caveat is that they do not have running water. So, unless you're Indonesian or have been living in Indonesia and have a conditioned system, I can't recommend them. I've heard that they are really really good. *Kaki Lima = Legs 5. On the cart 3, 2 wheels and a back support leg. On the peddler, 2. My absolute favorite late night treat. 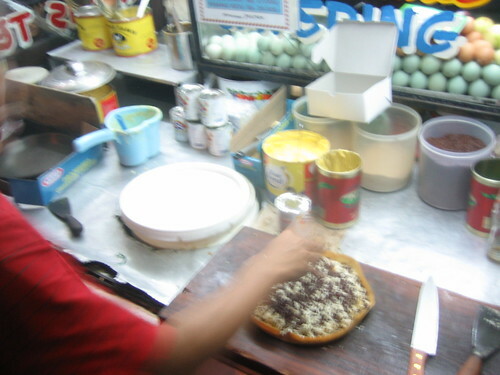 It's basically a large 12" pancake , topped with condensed milk, butter, cheese, peanuts and chocolate sprinkles, it's then folded over. It probably weighs in a 5 pounds. You can purchase one at a street stall or if its an established place a restaurant. 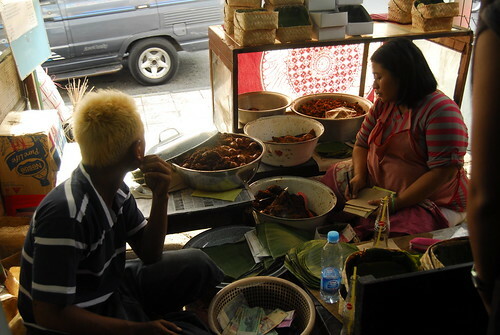 The most expensive street stall variant will cost Rp 20000.00 or US$ 2.50. It's too irresistible not try a steaming hot piece right there. They are so large you are guaranteed to have some left over for breakfast. The train my first choice for getting around within the island of Java. My favorite is the train that runs from Jakarta to Bandung. The tracks run on rails that go through beautiful mountainous terrain. This time, we took the 4 hour journey goes from Bandung to Yogya. There was a soccer/sepak bola match between the two rival cities later that afternoon. The train was filled with fans. I spent time with the crew in the dining car. It's not used as a dining car, since there is no AC. The sound of the tracks, the company of the locals and the coffee is worth it. 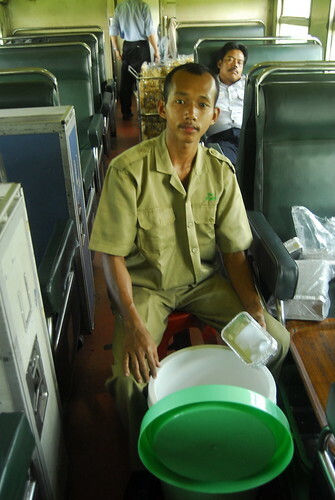 The train serves Bandung's famous Kopi Aroma. This is the best coffee I've ever had. This man is probably the hardest working on the train. He has several roles. In this picture he is getting portions of rice for our box lunch. *Kereta Api literally means Fire Cart. 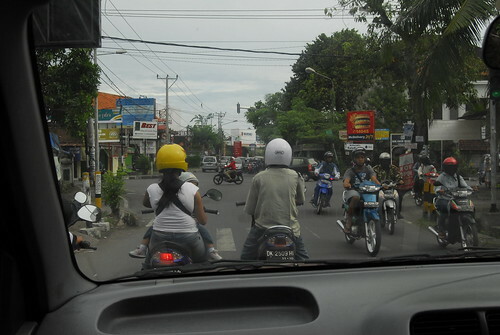 Impervious to jam macet, motorbikes is the way to get around. I've seen families on one bike. Bapak driving with a kid infront, Ibu behind with a kid infront and another kid behind her. In big cities like Jakarta, motorbike riders travel in huge groups, safety in numbers. In the weekend, people ride again, on rallys for fun. Notice how the baby is sound asleep. This was taken in Bali. Like in Yogya and Solo, lots of riders too. Late in the afternoon Sinta and I decided to take a walk on the beach. In the distance, I saw a man fishing. I was watching him for a while, not sure if I should leave him alone or if I should go up to him and talk. I decided to walk to him. I met Pak Made. To be friendly, I offered him a cigarette, he accepted. He told me he was on his motorbike, on his way home from and he decided to go fishing. It made me think of how lucky he is. He lives in paradise. 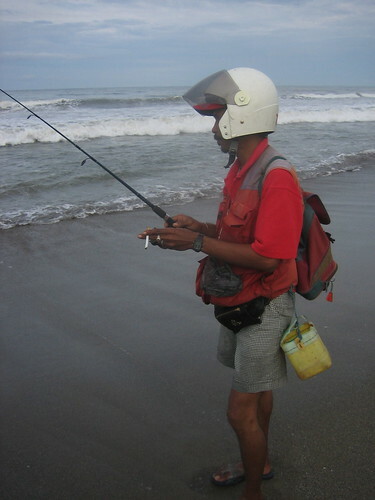 He is on his way home, riding his motorbike and he decides to try to catch some fish. How perfect is that? Perhaps he's thinking I'm the lucky one. 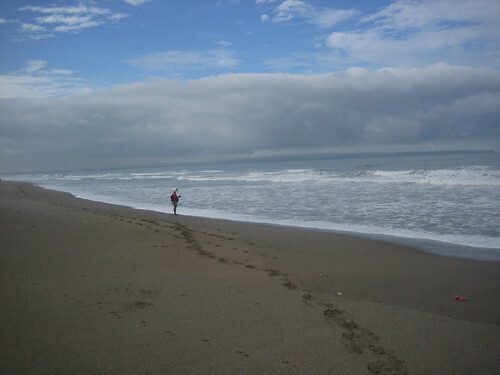 I'm able to travel to his paradise to briefly experience it and go back to mine. 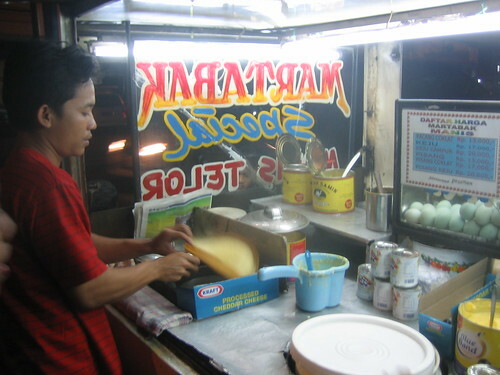 Yogya is famous for many things. The dish gudeg is one of them. The main ingredient of gudeg is green jackfruit known as nangka in Bahasa Indonesia. It is cooked in coconut milk, tamarind, palm sugar and many spices. Chicken and eggs are frequently added, but if your are vegetarian, these items are optional. Go to Gudeg Yudjum on Jl. 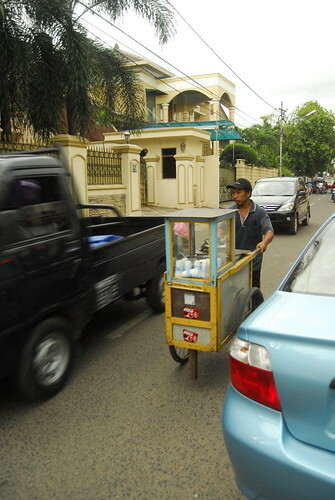 Widjilan, a becak driver will know. It is a very traditional place to experience this treat. They only have low tables. You have to have get used to sitting on the floor. For me, it's a little difficult, my old legs are stiff. Believe me, it's worth the discomfort. Gudeg with Opor Ayam and teh botol, US$1.80. I noticed a large amount of dogs wandering around the Balinese countryside. 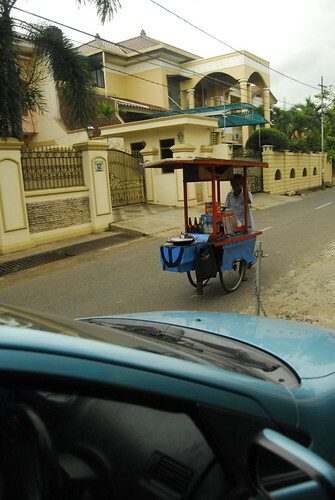 You don't notice them in Kuta, but on the road to Ubud or perhaps in Seminyak you notice. They wander in packs or in solitude. Some are feral some are domesticated. Some are cared for communally, some are lucky enough to be pets. They don't bother anyone, they're probably more fearful of humans if anything. Twice I witnessed near collisions between a dog and a vehicle. I asked our guide Ibu Made about them, she responded that they just are. From her inflection, I would think like squirrels or perhaps pigeons would be here in the States. I read that there are about 800,000 street dogs in Bali. There are some non-profits making a difference. The Balinese based, Yayasan Yudisthira Swarga. The Australian based, Bali Street Dog Fund. 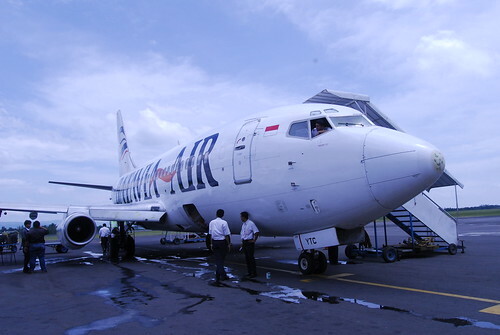 My departure at Soekarno-Hatta International Airport was pretty routine. There was a 1000,000 rupiah airport tax involved at check in. A document verification & a stamp at immigration and the next stop was the gate. More security checks at the gate. Foreigners and Indonesians were at this point separated until boarding. I made it back. I endured two forced sleepless nights, that resulted in walking around like a zombie during the day. This is what I had to do in order to have a productive work day. My clock is pretty much back to San Francisco. Why is it so much easier to adjust to vacation time than to reality time?